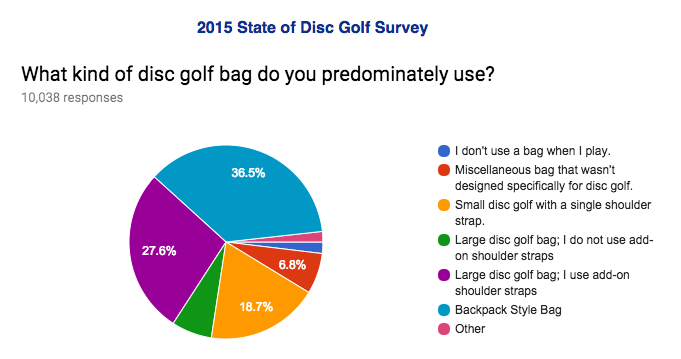 The majority of surveyed disc golfers use some sort of backpack bag. The backpack has been the trendy way to carry around discs over the past half decade, and with the recent addition of the more affordable backpacks like the Prodigy BP3 and Dynamic Discs Sniper, we expect this trend to continue to rise. For the recreational disc golfer, the single strap “starter bag” is still an adequate way to carry more than a handful of discs along with a water bottle, keys, phone and other on the course necessities. Small disc golf bags with a single shoulder strap had the second greatest share at 13.7%. In addition to the increased popularity, the share of disc golf carts, especially among tournament players, is on the rise. 8.6% of surveyed disc golfers said that they primarily use a cart. Go to any PDGA sanctioned tournament and the percentage of cart users is substantially higher. When we ran the survey in 2015 disc golf carts were not even an option. Over the last two years the biggest decline in disc golf carrying is the “Large Disc Golf Bag.” In the 2015 survey, 34.3% of those surveyed used a large disc golf bag with or without shoulder straps. Almost half as many (16.8%) primarily use a large disc golf bag according to the 2017 survey.